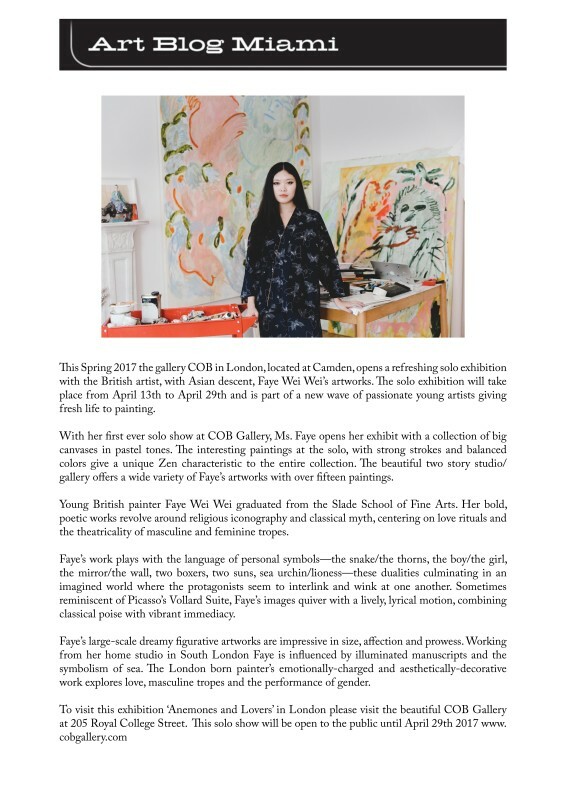 This Spring 2017 the gallery COB in London, located at Camden, opens a refreshing solo exhibition with the British artist, with Asian descent, Faye Wei Wei's artworks. The solo exhibition will take place from April 13th to April 29th and is part of a new wave of passionate young artists giving fresh life to painting. With her first ever solo show at COB Gallery, Ms. Faye opens her exhibit with a collection of big canvases in pastel tones. The interesting paintings at the solo, with strong strokes and balanced colors give a unique Zen characteristic to the entire collection. The beautiful two story studio/gallery offers a wide variety of Faye's artworks with over fifteen paintings.